“In real estate it’s location, location, location and for monarchs and other wildlife it’s habitat, habitat, habitat”, said Chip Taylor, Director of Monarch Watch. Monarch Watch, started in 1992 as an outreach program dedicated to engaging the public in studies of monarchs, is now concentrating its efforts on monarch conservation. “We have a lot of habitat in this country but we are losing it at a rapid pace. Development is consuming 6,000 acres a day, a loss of 2.2 million acres per year. Further, the overuse of herbicides along roadsides and elsewhere is turning diverse areas that support monarchs, pollinators, and other wildlife into grass-filled landscapes that support few species. The adoption of genetically modified soybeans and corn have further reduced monarch habitat. If these trends continue, monarchs are certain to decline, threatening the very existence of their magnificent migration”, said Taylor. 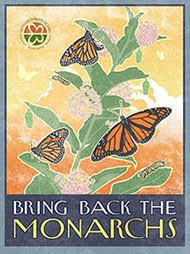 To address these changes and restore habitats for monarchs, pollinators, and other wildlife, Monarch Watch is initiating a nationwide landscape restoration program called “Bring Back The Monarchs.” The goals of this program are to restore 20 milkweed species, used by monarch caterpillars as food, to their native ranges throughout the United States and to encourage the planting of nectar-producing native flowers that support adult monarchs and other pollinators. This program is an outgrowth of the Monarch Waystation Program started by Monarch Watch in 2005. There are now over 4,000 certified Monarch Waystations – mostly habitats created in home gardens, schoolyards, parks, and commercial landscaping. “While these sites contribute to monarch conservation, it is clear that to save the monarch migration we need to do more,” Taylor said. “We need to think on a bigger scale and we need to think ahead, to anticipate how things are going to change as a result of population growth, development, changes in agriculture, and most of all, changes in the climate,” said Taylor. According to Taylor we need a comprehensive plan on how to manage the fragmented edges and marginal areas created by development and agriculture since it is these edges that support monarchs, many of our pollinators, and the many forms of wildlife that are sustained by the seeds, fruits, nuts, berries, and foliage that result from pollination. Read complete details at www.BringBackTheMonarchs.org.